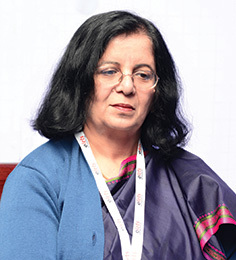 Dr. Neena Pahuja, Director General, ERNET, India talks about how IT is embracing the healthcare sector and how summits like Healthcare Leaders Forum aid industry leaders in working for future possibilities. In an interview with Elets News Network, she discuss about the challenges and adoption of IT in healthcare. Do you see the adoption of IT a challenge in healthcare sector? Absolutely! Before joining government I was part of a corporate hospital and as a CIO, I have worked with the doctors and I have seen that it is actually challenging for the doctors. The doctors havent been groomed although they are the best doctors in the country. Although most of the doctors are technologically savvy but when it comes to their typing on data on health records they are not comfortable. I think what we need to do is to possibly take education to the next level. What is the future of adoption of IT technology in healthcare? There is a huge plan in terms of digital India and in terms of connectivity but it is going to take time. As far as Digital India initiative, ministries are also looking at innovative ways of how we could do this connectivity in a faster and a affordable way. We need to start working on changing the reality of bandwidth. We are taking connectivity to North-East, to Andaman-Nicobar and naturally to the remote areas of India. We are looking at technology how to make it stable when it rains as connectivity stops working. So we are taking a special initiative from the Ministry where we are looking at how we could have stable connectivity in the areas where there is heavy rainfall. But it cannot happen in a day, the ution of the plans will take time. How does Healthcare Leaders Forum serve as a platform for sharing knowledge among the industry stalwarts? My association with eHealth is six years old and I have been a part of e-Health conferences from quite a long time. I think the conference brings in what is happening and what is the future roadmap thats what e-Health focuses on. The forum is taking care of industry trend, government plans, and how can people collaborate. We are making a beginning but I think it is also important to keep an eye on future while we create the complete platform otherwise we will be left behind. The number of hospitals that we are creating, number of AIIMS that we are creating, the number of medical colleges we are creating, we will not be able to create the capacity that we need today actually..